Hi there everyone!!! I hope you all had a fabulous Christmas. I went quiet on my blog this week so that I could spend some much needed time with my family. I have been working so much this month (two different jobs) so I wanted to take advantage of my time off. I didn't even go near my craft desk until today. I've been on a bit of a clean and simple kick lately and this card fits perfectly for the "Bellatastic Tuesday" challenge at SCS which is all about WHITE SPACE. Make sure you participate as you'll have the opportunity to win $25 to the Stamping Bella store. You have until Monday January 7th to get your entry in. Just make sure you add the keyword BELLADEC2012 so we can find it. 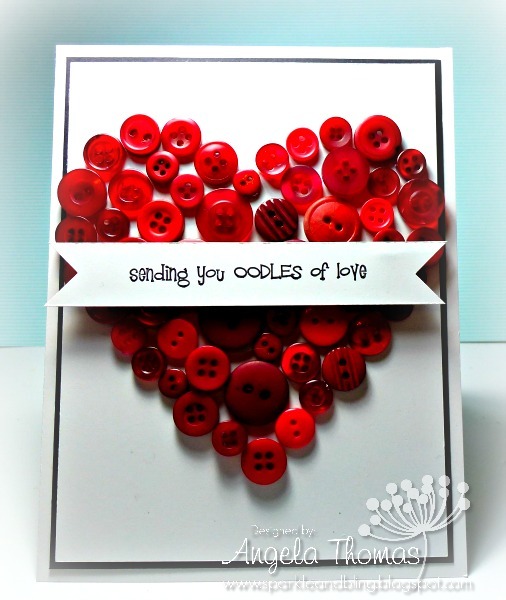 I have been surfing around on Pinterest and noticed people making cards with buttons for Christmas trees etc so I decided I wanted to make a clean and simple card using buttons to make a heart. I get the heart shape, I used my heart shaped nestabilities and traced around the edge. I then did the outer edge of the heart with buttons before adding the center buttons. For the sentiment I have used the sentiment from the Stamping Bella set called "Uptown Girl Lucille sends her Love". Fun eh? I plan on using the image from this set soon.